Since the first coming of the Lord was not with glory but with dishonor and indignity, He says, "When He shall come in His glory". For at the second coming He will come with glory, escorted by angels. First He will divide the saints from the sinners, delivering them from tribulations, and set them on His right, and then speak to them. He calls the saints sheep on account of their gentleness, and because they yield fruit and useful things for us, as do sheep, providing wool, which is divine and spiritual protection, and milk, which is the sustenance that is needed. The goats are the sinners, for they walk along the precipices and are unruly and fruitless. 34-40. Then shall the King say unto them on His right hand, Come, ye blessed of My Father, inherit the kingdom prepared for you from the foundation of the world: for I was hungry, and ye fed Me: I was thirsty, and ye gave Me drink: I was a stranger, and ye took Me in: naked, and ye clothed Me: I was sick, and ye visited Me: I was in prison, and ye came unto Me. Then shall the righteous answer Him, saying, Lord, when saw we Thee hungry, and fed thee? or thirsty, and gave Thee drink? When saw we Thee a stranger, and took Thee in? or naked, and clothed Thee? Or when saw we Thee sick, or in prison, and came unto Thee? And the King shall answer and say unto them, Verily I say unto you, Inasmuch as ye have done it unto one of the least of these My brethren, ye have done it unto Me. He does not give honor or punishment until He has first judged. For He loves mankind and teaches us to do the same as well, not to punish until we have made a careful examination. In this way "those who are punished after the judgement will have no cause for complaint." He calls the saints "blessed" as they have been accepted by the Father. He considers them to be inheritors of the kingdom to show that God makes them participants in His own glory as His sons. For He did not say, "receive", but rather inherit, as a man would say of his father’s estate. By "the least brethren" He means either His own disciples or, simply, all the poor. For every poor man is Christ’s brother for the very reason that Christ, too, spent His life in poverty. See also God’s righteousness, how He acclaims the saints; and see the good disposition of their mind, how they deny, with befitting modesty, that they have cared for Him. But the Lord accepts as for Himself the things that were done for the poor. 41-46. Then shall He say also unto them on the left hand, Depart from Me, ye cursed, into everlasting fire, prepared for the devil and his angels: for I was hungry, and ye gave Me nothing to eat: I was thirsty, and ye gave Me no drink: I was a stranger, and ye took Me not in: naked, and ye clothed Me not: sick, or in prison, and ye visited Me not. Then shall they also answer Him, saying, Lord, when saw we Thee hungry, or thirsty, or a stranger, or naked, or sick, or in prison, and did not minister unto Thee? Then shall He answer them, saying, Verily I say unto you, Inasmuch as ye did it not to one of the least of these, ye did it not to Me. And these shall go away into everlasting punishment: but the righteous into life eternal. He sends those on the left into the fire which had been prepared for the devil. For as the demons are without compassion and are cruelly and maliciously disposed towards us, it is fitting that those who are of like mind with them, and who have been cursed by their own deeds, should merit the same punishment. See that God did not prepare the fire for men, nor did He make hell for us, but for the devil—I make myself liable to hell. Tremble, then, O man, and understand from this that these men were not punished as fornicators, or robbers, or perpetrators of any other vice, but for not having done good. Indeed, if you consider things well, the robber is he who has much and does not give alms, even if he does no obvious injury. For whatever he has in excess of his needs, he has stolen from those who are in need and who have not received anything from him. If he had shared these things with them, they would not be in need. Now that he has locked these things up and kept them for himself, for this very reason they are in need. So he who does not give alms is a robber, doing injustice to all those whom he could have helped but did not, and for this reason he and those like him shall go away into eternal punishment which never ends; but the righteous shall enter into eternal life. 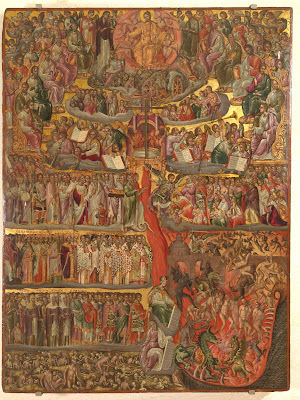 Just as the saints have unceasing joy, so too the unjust have unceasing punishment, despite the gibberish of Origen who says that there is an end to hell and that sinners will not be punished for ever, but that there will be a time when they enter the place of the righteous because they have been purified by suffering in hell. (1) Origen is clearly refuted here, both when the Lord speaks of "everlasting punishment", that is, never ending, and when He likens the righteous to sheep and the sinners to goats. Just as a goat can never become a sheep, neither can a sinner ever be cleansed and become righteous after the Judgement. "Outer darkness" (mentioned in the preceding parable of the talents) is that which is furthest from the light of God and for that reason renders the punishment more harsh. There is another reason that could be mentioned, and that is that the sinner is in darkness even in this life, as he has fallen away from the Sun of Righteousness, but as there is still hope of conversion, this is not yet the outer darkness. But when he has died and an examination has been made of the things he has done, then the outer darkness in its turn receives him. For there is no longer any hope of conversion, but he undergoes a complete deprivation of the good things of God. While he is here in this life he enjoys to some degree the good things of God, I mean, the tangible things of creation, and he believes that he is in some manner a servant of God, living out his life in God’s house, which is this creation, being fed by Him and provided with the necessities of life. But then he will be altogether cut off from God, having no share at all in the good things of God. This is that darkness which is called outer by comparison to the darkness here, which is not outer because the sinner is not yet completely cut off from this time onward. You, then, O reader, flee from this absence of compassion, and practice almsgiving, both tangible and spiritual. Feed Christ Who hungers for our salvation. If you give food and drink to him who hungers and thirsts for teaching, you have given food and drink to Christ. For within the Christian there is Christ, and faith is nourished and increased by teaching. If you should see someone who has become a stranger to his heavenly fatherland, take him in with you. While you yourself are entering into the heavens, lead him in as well, lest while you preach to others, you yourself be rejected. If a man should cast off the garment of incorruption which he had at his baptism, rendering him naked, clothe him; and if one should be infirm in faith, as Paul says, help him; and visit him who is shut up in the dark prison of this body and give him counsel which is as a light to him. Perform, then, all of these six types of love, both bodily and also spiritually, for we consist of both soul and body, and these acts of love are to be accomplished by both. 1. 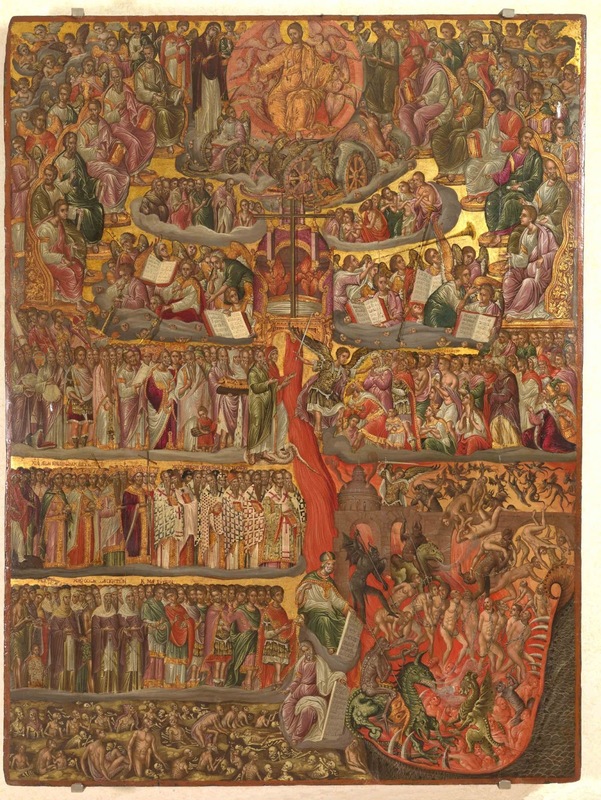 Origen’s false teaching of apokatastasis, the restoration of all things, was condemned as a heresy at the Fifth Ecumenical Council held at Constantinople in 553 A.D.